Men, women and juniors of all ages and abilities. Do I need to have golf clubs? No. I will provide equipment for the lesson if you do not have clubs of your own. 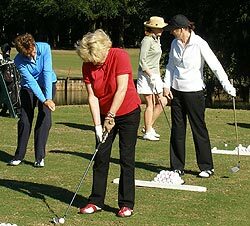 I would actually prefer if you do not buy clubs prior to your lesson as I can make an equipment recommendation or perform a clubfit if needed. Comfortable clothing - no denim, men should have a collared shirt. Golf shoes are not required – running shoes are just fine. Will you change my entire swing? No. I will work with your existing swing and simply improve what you already have based on your goal for the lesson. Are you a “Method Teacher”? No, I do not teach everyone the same. Each student is individual with unique strengths. Based on your personal goals, I will work towards helping you achieve them.